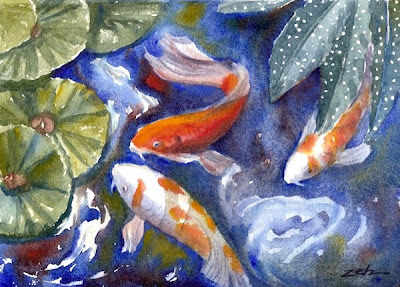 Here is a fourth painting of koi. Watching the movement of koi in a pond is very relaxing. I was looking to capture that peaceful feeling in this piece. This painting is sold. You can see more of my art at zehoriginalart.com. Thanks for stopping by and have a peaceful day. Thank you so much, Agramon. I'm glad that you enjoy it - you see exactly what I hoped someone would see in this piece.